Attention, baseball lovers! Seven-time Major League baseball All-star Dale Murphy will be visiting Okinawa to speak at the Church of Latter-Day Saints Futenma Building on Saturday, Aug. 4 from 7 to 8 p.m. Dale Murphy played for the Atlanta Braves from 1976 to 1990 and was chosen as the National League’s Most Valuable Player in 1982 and 1983. 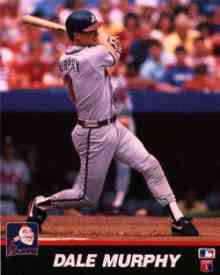 He is a seven-time All-Star and holds the record for the most RBI’s in the Major Leagues from 1982. Aside from baseball, Dale Murphy is also widely recognized for his humanitarian service. Come hear Dave Murphy as he speaks at this special event. An autograph session will follow. Everyone is welcome, so bring a friend or two! For more information, call Jaime Capener at 633-1508 or Allen Todd at 633-0388. Where: Church of Jesus Christ of Latter-day Saints Futenma Bldg. Located across from Futenma Gate 3 on Hwy. 330. Time: 7 – 8 p.m. Autograph session to follow. Information: Call Jaime Capener at 633-1508 or Allen Todd at 633-0388.